Factual error: Another flag gaffe: The Canadian flag in the 1920s was either the red ensign or the Union Jack. The Maple Leaf only became the national flag in 1965. Continuity mistake: When Eric Liddell is approaching the end of the Olympic 400 metre race the camera cuts away for reaction shots of those watching and responding to his approaching victory. The close-up shot of Harold Abrahams is taken from earlier in the film when Harold was reacting to his own defeat by Eric. You can see at the bottom of the frame that Harold is wearing a tweed jacket and not the blue official blazer of the British team which he would have been wearing while viewing Eric's race. Factual error: When Abrahams arrives in Cambridge by train there is a bridge across the tracks. At that time there was no bridge across the railway tracks at Cambridge station. It looks good but is wrong. Cambridge has an extremely long platform that serves trains both to and from London. Deliberate mistake: I don't think this film is supposed to be a biography, but merely a story which is based on actual events. In any case, when we first see Eric Lidell, it is 1920 and he has just returned from China to his homeland of Scotland. Eric would've been 18 years old in 1920. Ian Charleson, who was 31 at the time the film was made, looks his own age. Factual error: The incorrect American flag at the Olympics has already been mentioned. What about the one that can be seen in the background when Abrahams and friends are signing up to various clubs on their first day of term? It's a scene that consists of one four minute long shot and an American flag can be seen on the left of the screen just when Aubrey and Abrahams are discussing the birdwatchers club. Factual error: Once at the Olympics, Abrahams is being massaged in one scene by his coach, Mr. Mussabini, complaining how miserable he was about being "beat out of sight in the 200" and how he was trying to use this failure as motivation for the upcoming 100 meters. Wrong. In the actual 1924 Olympics, Abrahams won the 100 early in the competition, and lost in the 200 later on. Factual error: When the action gets to the 1924 Paris Olympics, all of the American flags, including the ones on the shirts of all the American athletes, have 50 stars. This design was not used for the American flag until 1959 when Hawaii became the 50th state. The 48 star flag, which should have been used, had a totally different arrangement of the star field with the rows of stars aligned vertically rather than the diagonal arrangement on the current flag. There's one grand sweeping shot of the flags of all the nations competing in the Paris Olympics. The camera pans across the stripes of Old Glory, but the shot is cut just as the blue star field would have come onscreen. Clearly the editor knew about the error, but it was too late for the rest of the picture, as the US athletes were the prime competition for the film's British hereos, and were in a lot of shots. Deliberate mistake: OK so its arguable whether this is a mistake, since it was a deliberate attempt by the film makers to make the story more dramatic, but here goes: Eric Lidell didn't want to run on a Sunday, but that was the day of his race. The real Eric Lidell found out several months beforehand and had his event changed with virtually no fuss. 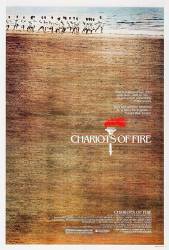 In the film a chance remark by a journalist alerts Eric to the fact and he changes his event at the last minute. Are we supposed to believe that Eric, a world renowned athlete who has been training for years, would not know what events he was down for and what days they were on when he boards the boat to France? When was he planning to ask anyone? Would anyone have told him? Continuity mistake: When Abrahams finishes his rendition of "He is an Englishman", the shot from the back of the room shows Nigel Havers character, and the man next to him, standing up to applaud. Everyone else stays seated. Cut to a closer shot from the front of Havers and the other guy applauding, and they are level with everyone behind them, i.e. they are still sitting down. Continuity mistake: In the scene where Harold Abrahams loses to Eric Liddell, Harold admonishes himself for 'looking for Liddell' towards during the race. Whilst the medium shots of the race show this, if you watch the entire race, at the beginning of the scene, he is always looking only forward. 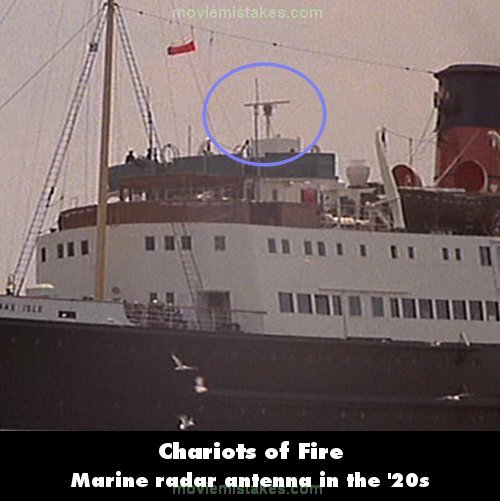 Factual error: The ship transporting the Great Britain team to France has a marine radar antenna, which did not appear on ships in that decade.